Update, March 26th: user-to-user auctions are now live. Update: Well, an Oopsie from me. Seems the user-to-user Mainland auctions aren’t *quite* live, but still in a testing phase. As such, this article has been revised. 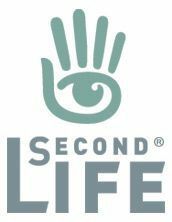 In July 2018, Linden Lab overhauled the Mainland auction system – see Second Life land auctions get a face-lift and the official blog post A Face lift for Auctions. 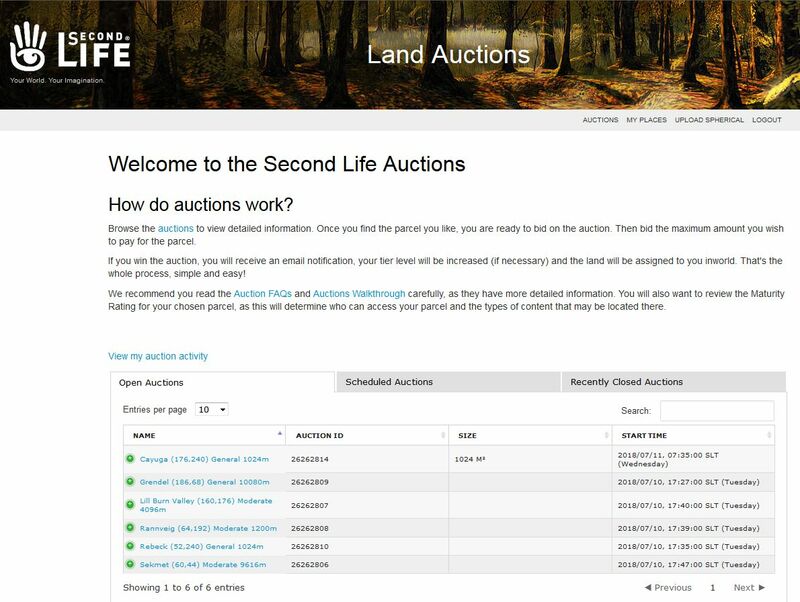 The “new” auction system leverages Second Life Place Pages as the medium for presenting land for auction and for placing bids, together with a new “cover page” listing available parcels up for auction. which can be found at https://places.secondlife.com/auctions. At the time the system launched, it was restricted to land being auctioned by Linden Lab, with the promise (at that time) that Mainland land holders would be able to start adding their own parcels “soon”. “Soon” took a step closer to becoming an reality on Tuesday, February 26th, when a new Knowledge Base article appeared, entitled Creating Your Own Auctions. It is designed to walk Mainland land holders through how to set a parcel for auction. According to Alexa Linden, who contacted me on the matter, the system is still in testing, but will likely be ready t go in the very near future. The parcel must be owned by an individual resident; group owned parcels cannot be auctioned. Auctions can only be created by the parcel owner, and the owner must have a verified email address. Parcels for auction must be set for auction via their associated Place Page. There is a 15% commission payable to Linden Lab on all successfully concluded auctions. When you create the auction, the ownership of the parcel is transferred to a temporary holding account named AuctionServices Linden. You will no longer be listed as the owner and will not be able to edit, cut, sell, or change the parcel in any way once you create the auction. If you cancel the auction, or if the auction completes without any bids, then the ownership of the parcel returns to you. Note: it is not clear what happens to any payable tier during this time, but I presume it remains payable until such time as the auction concludes. Melusina Parkin makes a return to DiXmiX Gallery about a year to the date after her latest exhibition there (see Melusina’s Minimalism in Second Life), to present Empty Spaces, this time in the gallery’s Black exhibition hall. Melusina’s work is often a fine blend of detail, space and minimalism, all carefully combined and crafted to present images that are elegant in their unique focus and rich in narrative and feeling. This is perfectly reflected in the twelve images presented in this collection which – if I might be so bold as to suggest – carry with them something of a thematic link to her previous exhibition at DiXmiX, Less is More (see link above), and perhaps more particularly to her June 2017 exhibition, Absences (see Melusina’s Absences in Second Life). As with that latter exhibition, Empty Spaces presents images that are perhaps notable for what is absent; rooms and hallways that are devoid of furnishing and décor – or, where furniture is present, it is noticeably absent signs of use; there is no-one seated on the couch or chair while the dresser appears unattended and the pool strangely sans water. But where Absences offered a single point of focus within a room or setting – a chair, a coat hanger suspended from a hook, a ruffled bed – Empty Spaces in many respects takes a step back; while some images do offer sight of a couch or chair, a rag hanging from a hook, most offer a much broader view; the focus is far more on the room, the space the image represents, than the object or item within it. Windows and doors, for example appear in many of the images – even those featuring a specific object – halls and open views can be seen, as at times, are hints of other spaces just out of our sight. Thus, the narrative many of these places is broader than that of Absences. What lies behind the closed door, is there something awaiting discovery around the corner of a hallway our in the spaces that lie between us and a distance doorway, hidden from our view by intervening walls? What might lie at the bottom of the empty swimming pool or beyond the opaque glass of windows, where shadows can only give hints – and perhaps deceive. These are images that again allow us to become playwrights; we can write the stories they hint at; but so to is there the sense of something more within them. Are we looking at images that reflect the lives of others, vignettes of their times and presence-in-absence? Or are we in fact looking at spaces in which the echoes of our own times and actions might still be heard? And this is what I continue to love and admire in Melusina’s art; through it she offers both and theme and idea that is – by the nature of her having taken the image – her own, but leaves the story behind it entirely down to us to define and tell. Thus, her exhibitions are always engaging and thought-provoking delights.